Prevent hose abrasion while extending your hose life. Parker Hose Protection Shields extend hose life by protecting the hose from abrasion that occurs when hose rubs against other hose, metal or concrete. 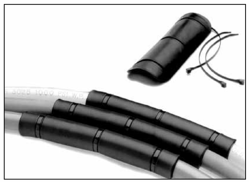 You don’t need to disconnect a line to install a Parker Hose Protector Shield the way you do with a continuous tubular sleeve. Just wait until the installation is up and running to see exactly where contact needs to be prevented. Use with hose from 1/4” to 2” I.D. Note: Parker Hose Protector Shield products are intended to prevent damage. They are not suitable as patches or repairs for lines which are already damaged or worn beyond safe use standards. Partek Defense | Provides protection to personnel and equipment in the event of a hose burst. Valuable in industries such as mining, agriculture, and construction. Contains hose bursts up to 12,000 PSI. Partek Wrap | Provides protection against abrasion and allows you to wrap mulitple hoses. Enables hose sleeve to be installed after the hose assemblies have been secured in place. Partek Sleeve | Provides protection against abrasion in two ways per the ISO 6945 specification: "AS" is strong enough to withstand greater than 200,000 abrasion cycles and "PS" can withstand greater than 50,000 abrasion cycles. PolyGuard | Provides protection against rugged operating conditions and abrasions. Made from black heavy-duty polyethylene shield for resistance against water, gasoline, hydraulic fluid and most solvents. ParKoil | Provides protection against hose kink and abrasion for applications that call for a tighter bend radius. Economical alternative with easy installation. Spring Guard & Armor Guard | Provides protection against rugged operating conditions by distributing the bend radii to avoid kinking of the hose and abrasions. Constructed of steel and plated to resist rust. Polyguard Strain Reliever | Provides protection against kinking of the hose. Made from flexible PVC for easy installation. Firesleeve | Provides protection against extreme temperature conditions. Easily slides over hoses and readily expands over fittings. Protection Shields | Provides protection against abrasion from metal, concrete and other hoses. Resistant to oil, lubricants, gasoline and most solvents. SELECTION GUIDE: Protective Hose Coils, Hose Sleeves & Hose Guard | Select any of your hose accessories according to your Parker hose series and size.